Hanami is a collection of 13 tetraptychs plus additional works. Hanami was produced as set of two 54 unique hand-illustrated playing card decks. View Full Series Below or Visit Product Website. The Hanami Decks and Rulebooks are now available for purchase. Print rulebooks are now available on Amazon, digital rulebooks on iBook Store, art prints on Redbubble, and decks on IndianWolf Studios. There is also a very limited number of uncut sheets still available from the IndianWolf Studios shop. Hanami (“flower viewing”) was inspired by the floral motifs and symbolism-rich imagery of traditional Japanese hanafuda. Hanami was designed as 13 tetraptychs, creating a unique floral scene for each month. Hanami was created following the i Nudi: A Tribute to Lovers series as a more traditional reinterpretation of hanafuda (Japanese Flower Cards). Hanafuda (known in Korea as 'Hwatu') are floral-themed playing cards that are rich in symbolism and popular in Japan, Korea, and Hawaii. Hanafuda cards have 12 suits. Each suit is represented by a month of the year (e.g. June) and each month is represented by a flower (e.g. Peony). Hanami was licensed by IndianWolf Studios LLC and was produced as a set of unique hand-illustrated playing card decks. These decks are available in two formats, Hanafuda and Fusion. Hanami was printed by Legends Playing Card Company (LPCC) and features casino-quality Emerald Finish. This is a limited quantity first edition print. What is the Fusion deck? Since traditional hanafuda cards lack pips and indices, we designed our own hanafuda indices to indicate the flower, month, and type of each card. We combined these indices with traditional hanafuda imagery and standard poker indices to create a multipurpose deck that could be used to play both Eastern and Western games. The Hanami hanafuda decks were designed to form a tetraptych for each month. 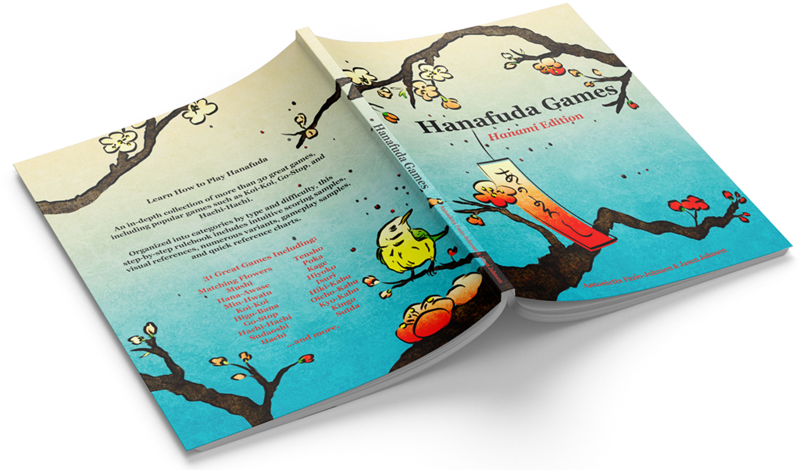 The Hanami edition of Hanafuda Games is a 236-page rulebook with 37 games, including popular games such as Koi-Koi, Go-Stop, and Higo-Bana. Organized into categories by type and difficulty, this step-by-step rulebook includes intuitive scoring examples, visual references, numerous game variants, gameplay samples, and quick reference charts. Our rulebook contains an in-depth collection of 31 games. Organized into categories by type and difficulty, this step-by-step rulebook includes intuitive scoring samples, visual references, numerous game variants, gameplay samples, and quick reference charts. Section II: Sequence games involve playing cards from your hand in sequential order with the objective to empty your hand. Sequence games are a great way to learn hanafuda month order. The Fusion deck is well- suited for playing Sequence games. View the full list of the games included in the rulebook. Hanami hanafuda indices were designed to indicate the flower, month, and type of each card. These helpful indices make the Fusion deck a great way to learn & teach hanafuda. Prototype mockups for the Hanami playing card decks and rulebook. To learn more about how you can obtain a limited copy of Hanami or the Rulebook, visit IndianWolfStudios Hanami.